The Hotel Mexico , two stars of Riccione managed directly by the owners, stands out for its convenient location, not far from the center and the sea. It has parking, air conditioning and free WI-FI connection. Accept small animals. 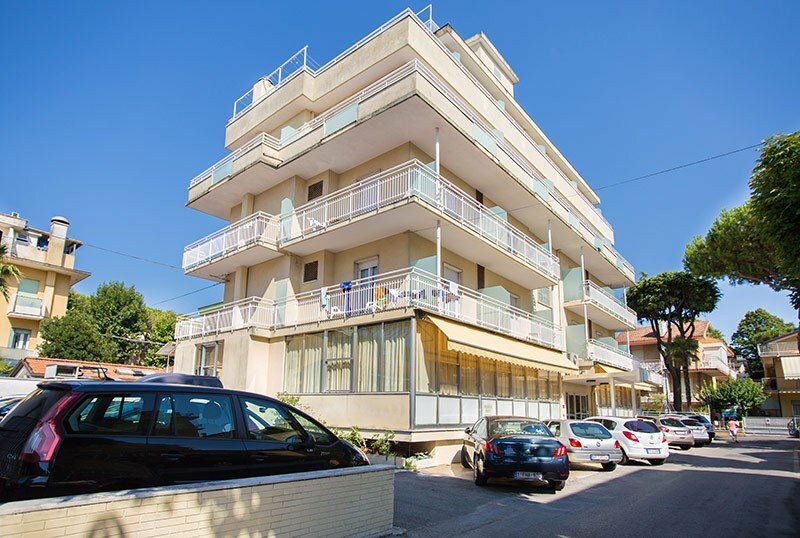 The hotel is located less than 5 minutes walk from the beach, in a central, convenient, quiet position, just a few steps from Viale Dante and Viale Ceccarini, the famous pedestrian shopping and entertainment areas. The structure is close to the main places of interest in the city: easy to reach, even on foot, are the sports facilities of the Stadio del Nuoto and the Palazzetto dello Sport. Not far away the parks of Aquafan and Oltremare for fun and the Terme di Riccione for wellness and relaxation. The rooms, furnished in a simple and functional, are all equipped with balcony, bathroom with private bathroom and flexible shower, hairdryer, air conditioning, free WI-FI, satellite TV and digital terrestrial, safe and direct dial telephone. Outdoor terrace with tables and chairs, as well as 2 air-conditioned restaurant rooms, living room with bar and plasma TV, free use of bicycles. PARKING : uncovered and available to all customers subject to availability. CONVENTIONS : beach, nightclubs and amusement parks Aquafan and Oltremare (discounted tickets, no queues at the cash desks, free entry for a second day of your choice, free souvenirs). BREAKFAST : sweet and savory buffet with ring-shaped cake and homemade pies, croissants, cold cuts, biscuits, jams, yogurt, juices and hot drinks. LUNCH AND DINNER : 2 menus to choose from local cuisine with meat and fish specialties, the dishes are always followed by a buffet of appetizers and vegetables. In the room : on request cots and cribs without additional costs. On the beach : baby park with a wide range of games for children, table football and table tennis. The hotel has an agreement with the Carla bath n. 98, near the hotel, and with the Marano Beach bath n. 135-136, adjacent to the Beach Village water park. In these bathrooms guests have at their disposal: cabins, hot showers, mini-park for children, table football and ping-pong, live entertainment. At the affiliated baths it is possible to make the all-inclusive formula with beach beach umbrella and sunbeds. The hotel offers its guests unlimited access to the Beach Village water park, with 4 waterslides, 2 swimming pools (one for children and one Olympic), mini club for children, fitness area, water aerobics, live entertainment. To reach the park you can use the bus n. 11 free with the park card. - Beach service from the third row at the bathroom N ° 98 + € 5.50 per day per person for umbrella and cot you pay directly to the lifeguard. You will get a 3% discount on the price list! One adult + 1 child: 0 to 5 years = 50% - 5 to 10 years = 30% - 10 to 16 years = 15%. With a minimum stay of 14 days you will be entitled to a discount of 3% on the price list. Offer dedicated to the family, for stays of at least 7 days from 01 June to 08 September, in Full Board Formula, minimum price per person per day € 38.00.